Teddy Roosevelt's progressive ideas are back in vogue--drawing comparisons to both John McCain and Barack Obama. So among the two, who's more of a Teddy? And a Big Stick in my hand. These words were written on the banner in front of the California delegation at the Progressive party’s national convention in 1912. 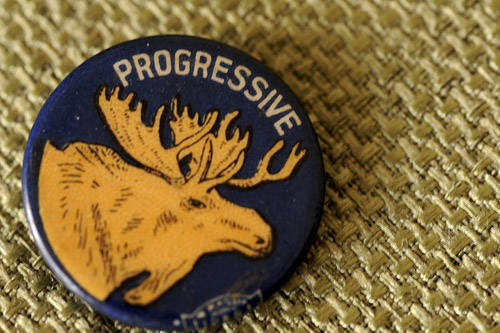 The symbol of the Progressive party was the bull moose. This year, while the “big stick” part of Theodore Roosevelt’s policy seems to have been forgotten, it looks like all major candidates are trying to somehow emulate the great progressive leader. Last year during the CNN/YouTube presidential debate for the 2008 primary season, somebody asked Hillary Clinton if she defined herself as a “liberal”. Her answer was as smart as it gets. She said that she didn’t think of herself as a “liberal”, but would rather use the word “progressive”. Recently, in a New York Times interview, the Republican soon-to-be presidential nominee John McCain declared that his model for a “conservative” politician is Theodore Roosevelt. No need to say that Teddy Roosevelt is not really a conservative model, given his progressive tendencies culminated in a third-party candidacy with the Progressive party in 1912. Many have come to see the Democratic presumptive nominee Barack Obama as the new Theodore Roosevelt for a number of reasons, including his proclivity for speaking about change and a “better country” for everyone. But why is everybody so keen on Teddy Roosevelt and his progressive ideas? The Progressive Era is a period in U.S. history around the beginning of the 20th century during which a number of political leaders across party lines fought for change. Their main goal was the true democratization of the American political system. Their proposals were very variegated and ranged from civil rights issues to effective political representation and environment-related stances. The so-called “progressive movement” gathered supporters from both major parties. The influence of progressive ideas can be observed in a strong and direct at least until Franklin Delano Roosevelt’s presidency, as far into the 1930s. The most renowned political leader of the progressive movement is President Theodore Roosevelt. Teddy Roosevelt is a rather controversial historical figure. He was famous for being an honest and incorruptible public officer in a world where corruption was rampant. As Governor of New York Roosevelt campaigned so hard against the political machines working within the state that New York political boss Thomas Platt teamed up with Pennsylvania boss Matt Quay to make of Roosevelt the vice-presidential nominee on the McKinley ticket in 1901. For the machine bosses, this was the best way to get rid of a Governor with whom it was impossible to “deal”. It seems that on that occasion Mark Hanna, President McKinley’s campaign manager and top adviser stated: “Don’t any of you realize that there’s only one life between that madman and the Presidency? Platt and Quay are no better than idiots!” A few months later, Hanna’s words proved to be prophetic: McKinley was assassinated and Roosevelt rose to the Presidency. During his Presidency Teddy Roosevelt fought for some progressive reforms, but his most interesting legacy on the progressive side is the platform of his third-party campaign in 1912. The Progressive party’s “Covenant with the People” called for federal regulation against trusts, the direct election of Senators, women’s suffrage, conservation of natural resources, better working conditions in factories, and even the creation of something that some historians believe to be very similar to what we now define as a “universal healthcare system”. Roosevelt lost that election to Woodrow Wilson, a Democratic leader with some progressive tendencies, but ultimately part of the 1912’s Progressive political platform was implemented. The rest of it is still, to this day, at the center of political debates. On the Republican side, Teddy Roosevelt could be considered the traitor that led the party to a political defeat in 1912. However, the tremendous popularity of this political leader, his modern vision of politics and democracy, his heroic life and his clean and successful political career makes him one of the most popular presidents of all times. The Republican Party is proud to define him a Republican President, notwithstanding his last presidential bid with the Progressive Party. For John McCain, getting inspiration from Roosevelt means to stress his own bipartisan inclination, his openness towards the enhancement of democracy across party lines and his reputation as a “clean” politician that does not bow to big business and corporate interests. On the Democratic side, the connection to Roosevelt is a little bit more complicated. Indeed it is always easier to find models within your own party, even if a loved and well-remembered historical figure such as Teddy Roosevelt can prove to be useful. It is even more useful given the “progressive” label. The use of this word today is extremely smart, appropriate and tactical. First of all, lately the word “liberal” has come to acquire a negative connotation in some circles. Second, the use made of this word in the United States is basically wrong. In the past it was in fact connected – as it still is today in Europe – to the “liberal” economic school of Adam Smith and David Ricardo, which was based on limited government and laissez-faire. The new, all-American use of this word in connection to strong governmental intervention in the economy and understanding of different types of social issues took place during the 20th century. Strangely enough, for convenience of deep conviction seems like progressive ideas are coming back at the American political arena in a weird cross-partisan manner. Now that candidates managed to give themselves this nice new label, the only thing that is missing is a solid theoretical elaboration of what 21st century progressivism might be!